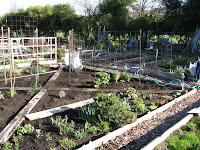 I spent a lot of time at my garden plot yesterday making some changes. There is more to do...plants to move...plants to plant and plants to remove. I am liking the change. I will have to change the way I water it, but the look is more interesting and totally designed by me! Let me know what you think. While we were working I discovered some fun things going on in my little garden. It seems to be inhabited by a toad. 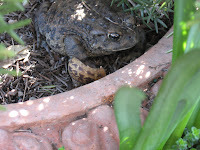 I think this is the same toad I found hanging out there last year. He sure has grown so he must be finding plenty to eat. I am thinking that he might need a name if he stays around much longer. Herb might be a fitting name since I found him under the lavender and he hopped away to the rosemary. 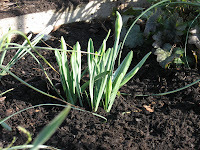 Other spring time surprises are the bulbs that are popping up all over from last year. I usually pull any that are in the way of any tomatoes I want to plant, but a few have survived and are ready to pop open any day. Now I am having so many ideas for new things to plant. I am feeling like the new layout has given me a fresh palatte to work with. I am hoping to get my boys out there and helping me a little bit. We have had some fun times working there in the past so as soon as I have more of a plan and they have a free spot in their schedules we will have to go make some more fun times. I have started my tomato seeds and they are coming up already so it won't be long. 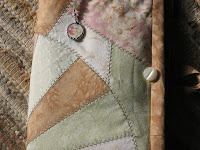 A sewing update has me finishing a needle book to keep track of all my different kinds of needles. I have put it to good use already on a project that I am working on for a special birthday coming up that required some embroidery. Here are a few sneak peaks at those projects. 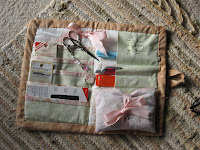 The embroidery project will have to wait there is a problem with the file and it won't upload to this site. I'll work on that for later!